Click to listen to episode (2:36). From the Cumberland Gap to the Atlantic Ocean, this is Virginia Water Radio for the week of August 12, 2013. This week, we feature another mystery sound. Have a listen for about 10 seconds, and see if you can guess what’s making the repeated cooing sounds, and what that they might have to do with water. And here’s a hint: predicting the weather is rarely just like clockwork. If you guessed a cuckoo, you’re right! That was the call of a Yellow-billed Cuckoo, recorded around sunrise on August 9 in Blacksburg. Virginia is the summer home of two cuckoo species, the Yellow-billed and the Black-billed. Both species are found in woods, thickets, and orchards; both are secretive and are heard more than seen; and both feed primarily on insects in summer, especially on caterpillars. They’re also in the same family as the Roadrunner, and in fact cuckoos also sometimes run or hop along the ground to capture prey. Now all of that may be interesting, but what do cuckoos have to do with water, particularly? For that, we turn to folklore, which has nicknamed both species as “rain crow” from the belief that they tend to call more frequently before rain. Cuckoos are only one of the many kinds of animals considered in folklore to predict rain or other weather. For example, a 1946 Duke University publication on popular beliefs and superstitions includes 25 pages of comments from many states about weather prediction by animals, from mammals and birds to spiders and crawfish. How much truth lies behind that folklore? I certainly don’t know, but, for what it’s worth, it did rain the day I recorded the Yellow-billed Cuckoo! 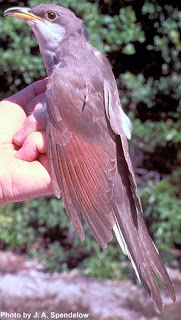 Yellow-billed Cuckoo, 2008. Photo by J.A. Spendelow, made available for public use by the U.S. Fish and Wildlife Service’s National Digital Library, online at http://digitalmedia.fws.gov, accessed 8-12-13. Acknowledgements: Thanks to David Brady, Tom Brobson, Eric Day, and Stephen Schoenholtz for information about Yellow-billed and Black-billed Cuckoos. Information on the Yellow-billed Cuckoo and Black-billed Cuckoo was taken from the Virginia Department of Game and Inland Fisheries “Fish and Wildlife Information Service” Web page at http://vafwis.org/fwis/?Title=VaFWIS+Species+Information+By+Name&vUT=Visitor; from the Cornell University Lab of Ornithology’s “All About Birds” Web site at http://www.allaboutbirds.org/guide/search, and the “Birds of North America Online” Web site from the Cornell University Lab of Ornithology and American Ornithologists’ Union, online at http://bna.birds.cornell.edu/bna (subscription required for the latter Web site); A Guide to Field Identification of Birds of North America, by Chandler S. Robbins et al. (New York: St. Martin’s Press, 2001); and A Field Guide to the Birds East of the Rockies, by Roger Tory Peterson, (Boston: Houghton-Mifflin, 1980).